Starting a new business and helping existing ones grow are top priorities for our city and our region. The regional economic development agency has an option for both streams coming up this month. Enterprise Saint John’s, Navigator Venture Validation Program is looking for aspiring entrepreneurs for its 13-week business course which begins September 10th. The course looks at the viability of a business concept from idea to launch. ESJ’s Entrepreneur Development Officer, Dakota Lutes, says this might be the best time to get started on a business concept people have been sitting on for a while. “I always notice a spike in people interested in launching their own business in January. They have so much excitement and urgency, but it can be challenging to support them. Mentally they’re ready, but they haven’t taken the time to test their ideas viability. Start in September and in January you will be prepared for success. If you want to win in business, you need to plan,” says Lutes. Participants will get access to the experience and advice from community business leaders and mentors such as Dan Doiron and Greg Fleet from the University of New Brunswick and Rivers Corbett from Opportunities New Brunswick. Will Bursey, who was in the last round of aspiring entrepreneurs says he’s still using what he learned in the program. He finished the program in July and plans to open a premium dog daycare by the end of the year. “I’m constantly referencing back to what I learned. It especially helped me refine the pitch for my business idea and something I’m using now as I go to secure a small business loan,” says Bursey. At the same time the VVP starts, a session meant to encourage innovation and growth will also begin. 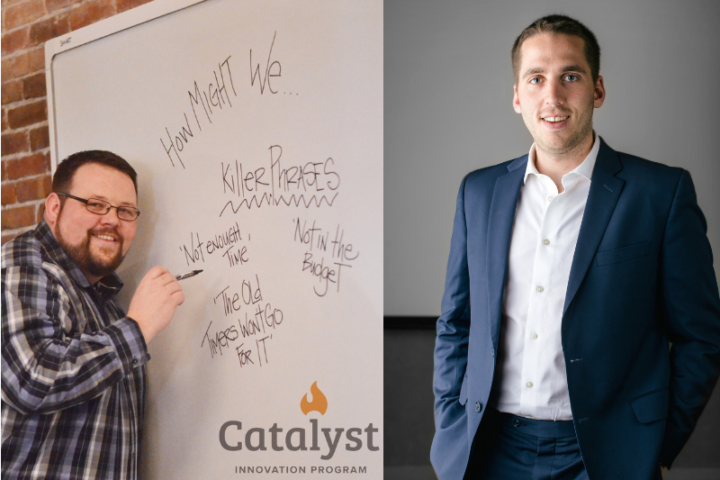 From September 10-12th, the Catalyst Innovation Program will offer a the 3-day session that teaches the Simplexity Process. It was developed by Min Basadur, a former executive with Proctor & Gamble who came up with the methodology. His research found businesses that used the process could create well-rounded teams that produced better ideas and better results. “Businesses that understand how their employees approach and solve problems have a competitive edge. They are better able to utilize the skills of their team to improve results. Organizations I work with are turning to new, creative ways to handle those challenges,” says ESJ’s Senior Economic Development Officer and Simplexity Facilitator, Mark Breen. CBCL Limited, Consulting Engineers is one of those companies that has used the process. CBCL has 300 staff in 8 offices across Atlantic Canada. “I am a big believer in the Simplexity process. We have utilized the Simplexity techniques in aspects of our business related to Strategic Planning, Business Development initiatives, and Growth Strategies. I am in the process of introducing the program to other parts of our organization,” says Executive Vice-President, John Flewelling. People looking for register for the Venture Validation Program can e-mail Dakota Lutes at dakota@enterprisesj.com Those interested in registering for Simplexity training can e-mail Mark Breen at mbreen@enterprisesj.com.